The Minuteman was the world's first solid-fueled Intercontinental Ballistic Missile (ICBM), and has been the mainstay of the USAF's ICBM force ever since its deployment. Because international arms reduction treaties led to the early retirement of its designated successor, the LGM-118 Peacekeeper, the Minuteman is now the only land-based strategic missile of the United States, and will remain so for the foreseeable future. Solid-fueled rockets have obvious advantages when compared to liquid-fueled ones, the most important being very long storage life of the motors, and the lack of time-consuming and potentially dangerous fueling processes. However, when ICBM development began in the 1950s, very large solid rockets were beyond the technology of the time. However, progress was made, and by mid-1957, pre-development studies for a solid-fueled ICBM were firmly under way. In February 1958, the Minuteman program was officially started, and in October that year, Boeing was selected as prime contractor for the new SM-80 Minuteman ICBM. The SM-80 was a three-stage design, using in its initial version Thiokol M55, Aerojet General M56, and Hercules M57 solid rocket motors for the stages. Auxiliary solid-fuel rocket motors used in the Minuteman design included a Hercules SR11-HP-1 retro motor, and Atlantic Research SR59-AR-1 pitch and SR61-AR-1 spin motors. The missile was guided by an all-inertial navigation system. It was originally planned to base the SM-80 not only in hardened silos, but also on special trains, using the nation's railway network to create mobile ICBM squadrons which would have been all but immune to a pre-emptive strike. However, this plan was dropped in December 1961 for financial reasons. Tests of XSM-80 Minuteman prototypes began in 1960, and in November 1961 the first successful silo launch of an XSM-80 occurred. The first production missiles, designated HSM-80A Minuteman IA, became operational in November 1962. A total of 150 Minuteman IA missiles were deployed in silos. The Minuteman IA missile was somewhat limited in firepower (its W-59 warhead had a yield of 1.2 MT) when compared to the contemporary SM-65/CGM-16 Atlas and SM-68/HGM-25 Titan missiles. The HSM-80A's guidance system could store only one set of target coordinates, so it was less flexible than later Minuteman models. However, because it could be launched instantly, the Minuteman was the first missile which could make the horror vision of nuclear "turnkey" warfare a reality. Elaborate schemes were therefore set up to prevent accidental or unauthorized firing of the missiles by the launch crews. The improved HSM-80B Minuteman IB was first deployed in April 1963. The HSM-80B replaced some HSM-80As, and deployment was finished in June 1965 with 650 missiles in silos. The Minuteman IB featured an improved second-stage motor, and could be fitted with a new Mk.11 reentry vehicle and larger warhead (W-56, 2 MT), increasing range and firepower. Its guidance unit could store two targets, enabling the missile to switch to a secondary target after launch if the primary couldn't be reached for any reason. When the mobile basing requirement for the Minuteman was cancelled in December 1961, this also lifted some restrictions on missile size and weight. It was now possible to increase the performance by enlarging rocket stages, as long as the missile would still fit into the silos. Therefore the USAF began the Minuteman II program in 1962, with the missile being designated as HSM-80F. I haven't found any traces of -80C, -80D, or -80E designations, so these were either skipped for unknown reasons, or assigned to preliminary or interim designs before the final Minuteman II. Details of the HSM-80F are discussed below under its post-1963 designation of LGM-30F. Suffixes -30C, -30D, and -30E were not assigned. The LGM-30F Minuteman II featured many improvements. It had a completely new Aerojet General SR19-AJ-1 second stage motor, which increased range by about 1600 km (1000 miles). Its guidance unit used solid-state circuitry, and could store up to eight sets of target coordinates. 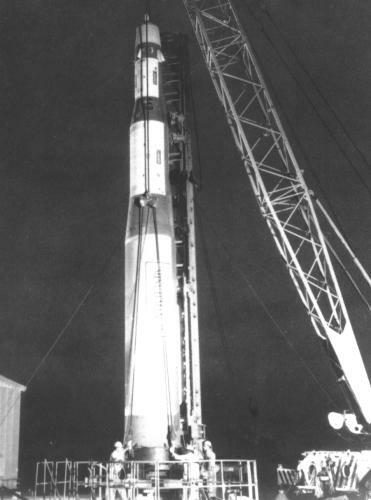 The first LGM-30F launch occurred in September 1964, and the first missiles became operational in August 1965. Eventually 500 LGM-30Fs were placed in silos, some replacing older LGM-30A/B missiles. The Minuteman II initially experienced a lot of reliability problems with its new guidance unit, because soild-state electronics were very new at the time, but the problems were eventually solved. The LGM-30F was the first U.S. ICBM to use decoys (Tracor Mk.1) in its warhead section (MK.11B or Mk.11C RV). 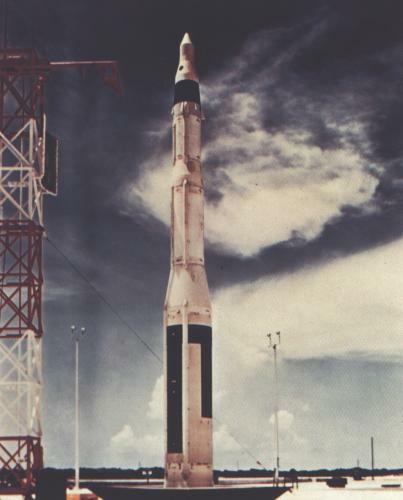 The LGM-30F was also the missile selected for the ultimate ERCS (Emergency Rocket Communication System), and it replaced the interim MER-6A Blue Scout Junior rockets in this role in October 1967. The designation LEM-70A was probably reserved, but not actually used, for the Minuteman ERCS missiles. 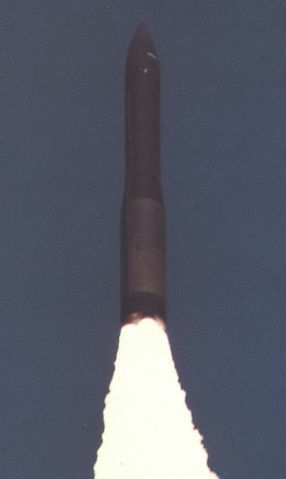 The LGM-30G Minuteman III was an improved LGM-30F with a new enlarged third stage (with the same diameter as the second stage), using an Aerojet SR73-AJ-1 motor, and a radically new warhead section. The warhead section carried three Mk.12 MIRV (Multiple Independent Reentry Vehicles), each with a 170 kT W-62 thermonuclear warhead. To use the MIRV capability effectively, a small post-boost liquid-fuel restartable rocket was incorporated in the warhead section. This rocket was used for course changes between the release of the individual Mk.12 RVs for truely independent targeting. A new guidance unit was also needed to control these manoeuvers. Development of the Minuteman III started in July 1965, and the first launch occurred in August 1968. Deployment began in April 1970, and eventually 550 LGM-30Gs were placed in silos, some of them as replacements for earlier Minuteman missiles. By 1969, the final LGM-30A, and by 1974, the final LGM-30B was retired. Production of the Minuteman ended in January 1977, after more than 2400 missiles had been built. Since then, many missiles were refurbished, because cracks in the solid fuel required a complete refill of the motors. The future of the Minuteman force was for many years dictated by the Strategic Arms Reduction Treaties (START). As a result of START, production and deployment of the LGM-118 Peacekeeper, originally developed as a Minuteman successor, had been halted. START II limited the land-based ICBM force to 500 single-RV missiles, so all LGM-30F Minuteman IIs have been retired or converted to single-RV Minuteman IIIs, and the remaining Minuteman IIIs were planned for conversion to single warheads. However, since the demise of START II these plans have been dropped, and some LGM-30Gs have retained their MIRVs. However, after the retirement of the Peacekeeper in September 2005, the latter's more modern Mk.21 RVs are available, and all LGM-30G missiles will have their three Mk.12A RVs replaced by a single Mk.21. This conversion is planned to be completed in 2010. There are also ongoing programs to replace propulsion and guidance components of the LGM-30G with modern systems. The Minuteman III is expected to remain in service until at least 2020. Between January 1997 and December 2002, retired Minuteman II missiles have been converted as sub-orbital launch vehicles to provide targets for 11 flight tests of the GBI (Ground-Based Interceptor) missile defense program. Current prime contractor for the latest variant of these launchers is Orbital Sciences Corp, which labels them as Minotaur 2 TLV (Target Launch Vehicle). The official designation NLGM-30F has been allocated to Minuteman IIs converted to test vehicles, but it is not quite clear if the designation is actually applied to the Minotaur 2 TLV. The motors of retired Minuteman missiles have been used since the early 1970s to assemble cheap high-performance rockets for experimental and test purposes, like boosting targets or interceptor vehicles in the ongoing ballistic missile defense development program. Examples for such vehicles include the Space Vector Aries, Coleman Hera, OSC SR19-SR19, OSC Storm, Lockheed Martin PLV and Coleman SRALT/LRALT rockets.